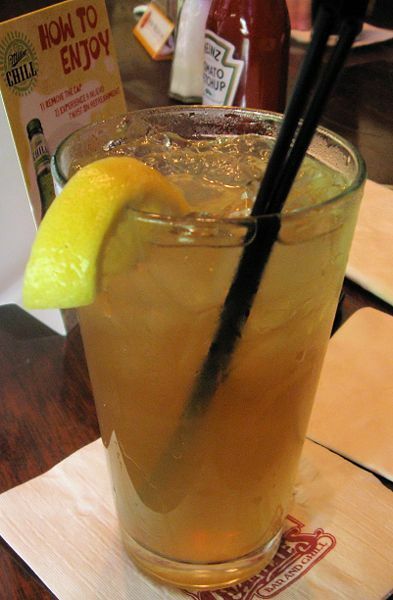 A Long Island Iced Tea, a summer drink, is a highball made with, among other ingredients, vodka, gin, tequila, and rum. A popular version mixes equal parts vodka, gin, tequila, rum and triple sec with 1 1/2 parts sour mix and a splash of cola. Most variants use equal parts of the main liquors but include a smaller amount of triple sec (or other orange-flavored liquor). Close variants often replace the sour mix with sweet and sour mix or with lemon juice, the cola with actual iced tea, or add white creme de menthe. Left: The Long Island iced tea was named for its resemblance to non-alcoholic Iced tea. However, most variants do not include any tea, despite the name of the drink. Some restaurants substitute brandy for the tequila. The drink has a much higher alcohol concentration (~28%) than most highballs because of the proportionally small amount of mixer. Long islands can be ordered "extra long" which signals the bartender to even further increase the alcohol to mixer ratio. Long Island Iced Tea served outside the States is often made of liquors and cola alone (without sour mix), with lemon or lime juice, orange juice or with lime cordial. In the UK Angostura bitters replaces sour mix in the cocktail. Mix ingredients in glass over ice, stir, garnish and serve. Serve in a highball glass, on the rocks; poured over ice, garnished with a lemon slice.